Salsa trumpeter and music teacher, Mario Ortiz, demonstrates salsa steps to his class at Hialeah Gardens Middle School. 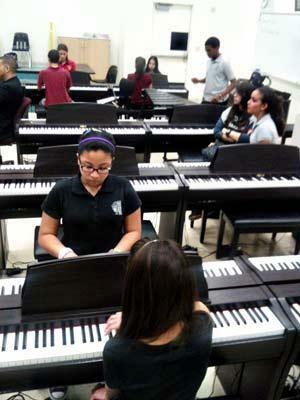 Students in Mario Ortiz’s music class at Hialeah Gardens Middle School. Eighth grader Jonathan Garcia, plays xylophone in the back. 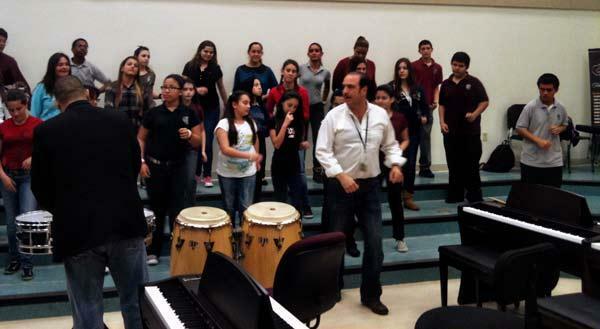 Music teacher Mario Ortiz has been teaching classic salsa tunes to elementary and middle school students for 14 years. Outside the classroom, Mario plays trumpet in a salsa group. He learned music from his father, who was also named Mario Ortiz. The elder Ortiz was a well known salsa bandleader (for the Mario Ortiz All Star Band) in Puerto Rico in the 1960s. He died in 1999. Two years ago, Mario put out an album called Tributo 45 Aniversario to honor his father. That album was nominated for a Latin Grammy. He also performed at the Adrienne Arsht Center last year with Latin jazz pianist, Larry Harlow, and his orchestra. However, Mario Ortiz is still teaching music. 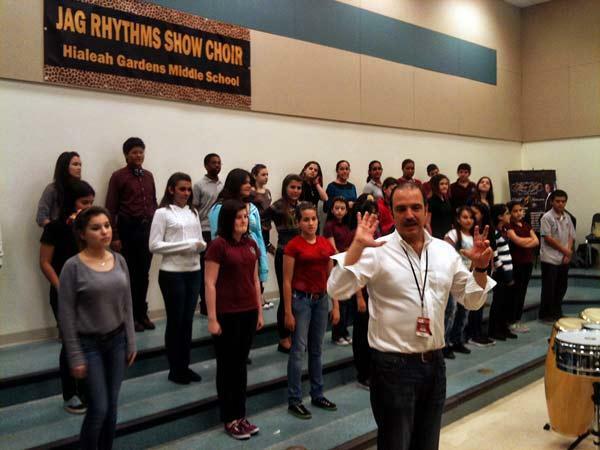 He coaxes students at Hialeah Gardens Middle School through the “foward and back” of basic salsa dance steps, leads them in clapping theclave rythym, and teaches them to sing and play songs like “El Cumbanchero” on piano and xylophone. Ortiz wants to be sure these kids don’t just associate “Spanish music” with the tired stuff adults listen to at parties (to paraphrase the words of eighth grader Christine Carbonell). He wants them to make salsa rhythms their own. The huddle of salsa chorus students waiting in front of his classroom door every morning is a good sign that Mr. Ortiz is making progress. Click the player above to listen to the story. If you enjoyed this story by Laura Isensee, you might also enjoy her audio postcard from a Hialeah coffee shop that sold Cuban coffee for three cents a cup.